Click here to download the Sage worksheet used in preparing this article. 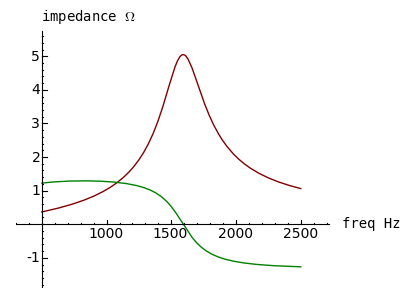 This page shows how Sage manages complex numbers in the analysis of electronic concepts like impedance. Since we're surrounded by electronics in all directions, I thought this would be a useful and educational example of what Sage can do. Complex numbers aren't all that complex if they're pictured as two-dimensional vectors. Just think of a two-component Cartesian vector — its elements are at right angles to each other and its properties are easy to understand. For a Cartesian vector, we might name the components x and y and think of them as the base and height of a right triangle (Figure 1). It's important to emphasize that the three notation systems in Figure 1 are equivalent and interchangeable — it's a matter of deciding which notation is appropriate to a particular problem. For the resistor, voltage and current are synchronized in time, which means the resistor dissipates power (voltage times current) as heat. For the inductor, measured current represents the time integral of voltage (current lags voltage by 90°). Because an inductor's voltage and current are out of phase by 90°, an ideal inductor doesn't dissipate any power but stores energy as a magnetic field. For the capacitor, measured voltage represents the time integral of current (voltage lags current by 90°). Because a capacitor's voltage and current are out of phase by 90°, an ideal capacitor doesn't dissipate any power but stores energy as an electrical field. For an RLC circuit and depending on the connection details, the circuit is appropriately described using equations involving complex numbers. 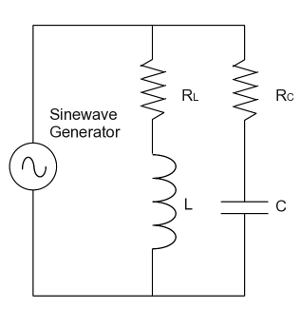 Such a circuit is normally analyzed with respect to time-varying applied voltages — a typical example would be an RLC circuit driven by a signal generator. Where i2 = -1. 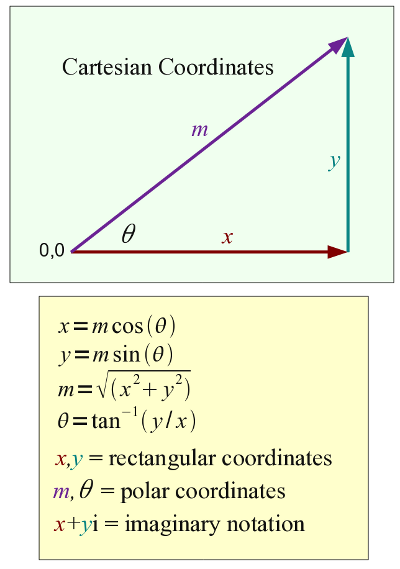 Without providing all the details, this means that y is orthogonal (at right angles) to x. That in turn means we can treat x and y as a Cartesian vector (Figure 1) and derive some useful values. Function f(x,y) constructs a complex number from the arguments x and y. In this case, "abs(x)" produces the magnitude of the provided complex argument (or the hypotenuse of a right triangle with x and y as base and height, see Figure 1). It turns out that (3,4,5) is the first Pythagorean triple, which means 32 + 42 = 52. Intuitively, since 4 > 3, the angle should be more than 45 degrees. In electronics the term "reactance" refers to the behavior listed above for inductors and capacitors in which they store energy instead of dissipating it. 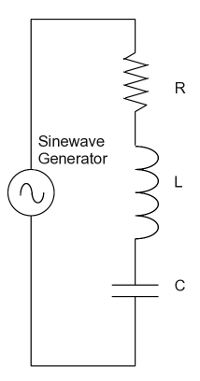 The most important thing to understand about reactance is that voltage and current are orthogonal (at right angles), which explains why ideal inductors and capacitors don't dissipate any power (real-world reactors have some internal resistance, so they dissipate some power). 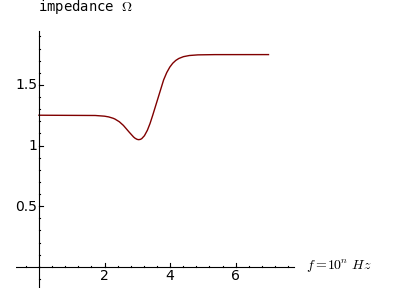 Note the presence of "i" (i2 = -1) in both the inductive and capacitive reactance subexpressions. This serves to keep the reactances at right angles to the resistance. First, I am using a roundabout way to plot these results. This is required because of a bug in Sage 4.1.2 that prevents plotting complex numbers without some special precautions. I am calling a special function "plt()" that appears above in the worksheet initialization block. 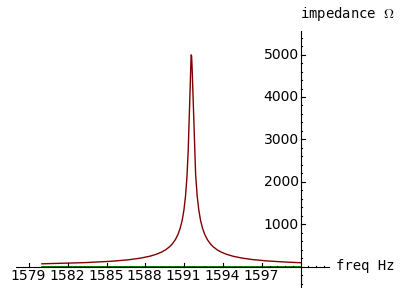 In this graph the red trace represents admittance (with units of mhos or Siemens), because I decided to plot 1/q(f) rather than q(f) (with units of impedance), in order to produce a definite peak. 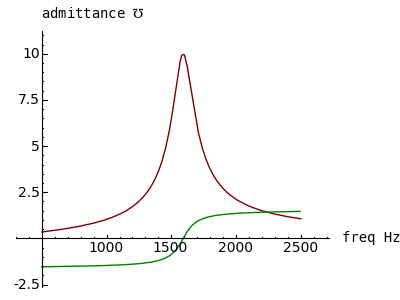 For this example, the numerical root finder "find_root()" was able to find a zero using arg(x), which, as shown in the above graph, crosses zero at resonance. It should be pointed out that the "lambda f: float(arg())" construction is a temporary work-around for a bug in the current (4.1.2) version of Sage. Another point about the above graph is that the red peak rises to about 10 mhos (units of admittance), which is consistent with our circuit's resistance value of .1 ohm and the fact that our "signal generator" is producing 1 volt. We see the opposite effect — a broadening of the resonance curve, a decrease in the amplitude of the resonance peak and a more gradual phase change near resonance. I want to emphasize to my readers that these results are perfectly consistent with physical measurement of actual circuits. 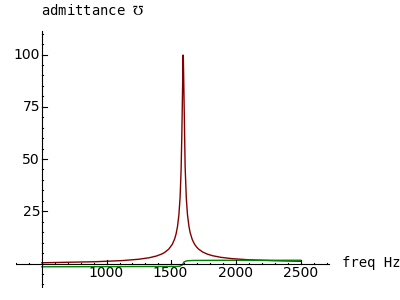 About these graphs, it would be nice to have two independent graph scales, one for the amplitude trace and another for the phase angle, so the green trace doesn't disappear when high admittance values are being plotted, but it seem Sage hasn't acquired that feature yet. One more observation about circuits possessing impedance — it is almost never the case than one can determine the power being dissipated in the circuit by measuring voltage and current. The reason is that the voltage and current are nearly always out of phase with each other, and the actual power is roughly proportional to the voltage times the current, times the cosine of the phase angle between voltage and current. The impedance is now 10Ω at resonance. Think about this — at the circuit's resonant frequency we have increased the circuit's overall impedance by decreasing one of the resistances. Remember that, in this idealized circuit, the resistors are the only devices able to dissipate power. 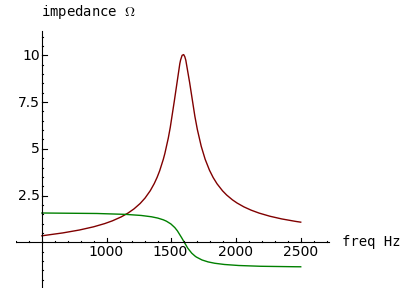 Isn't it ironic that we can increase impedance by decreasing a resistance? That's more like it. Remember this about parallel-resonant circuits — the impedance at resonance is determined by the distributed resistances in the circuit, and if they could be eliminated, the impedance at resonance would be infinite, but for an infinitely narrow bandwidth. 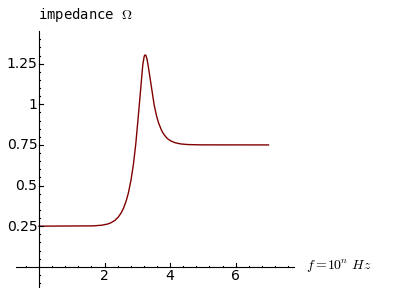 Real-world circuits tend to have a finite bandwidth and a finite impedance, as shown by the first few graphs in this section. 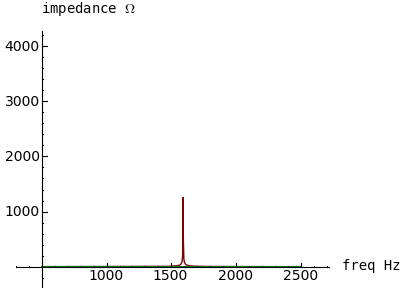 Think about that result — the impedance at resonance is less than the resistance value in either leg. Now make one more plot — set both rl and rc to 1Ω. I won't reveal the result — it defies expectation, but a clue can be seen in the above two plots. This kind of virtual circuit modeling is a very fruitful way to learn about electronic circuits in a short time, especially when compared to building and testing actual circuits. It's also a great deal less expensive. I must say, even though I've designed circuits for years including some aboard the NASA Space Shuttle, I didn't know about the outcome for two resistances of 1Ω in a parallel-resonant circuit. Even though I never realized it before, I can picture the reason (it has to do with internal versus external currents). And if I hadn't built a model, I would never have known about it. 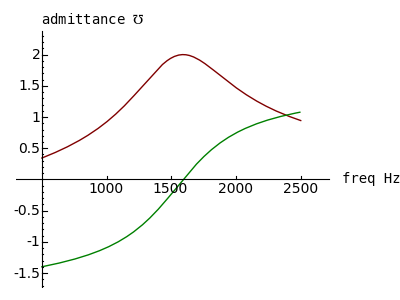 I've been using computer algebra systems for years, and what impresses me most about Sage is the speed with which one acquires useful results, as well as the fact that one can easily export a decent graphic of an equation or a plot (for me personally, that's a revelation). I want to close with a discussion of the symbolic representation for admittance, the reciprocal of impedance, expressed in the unit "mho" (that's ohm spelled backwards, if you missed it) or "Siemens" in SI units. First, there isn't a defined HMTL entity for this symbol, so when writing HTML one must use either a graphic image or an explicit Unicode value: &#8487; = ℧ (this might fail on some browsers or systems without Unicode font support). I expect eventual mass confusion.